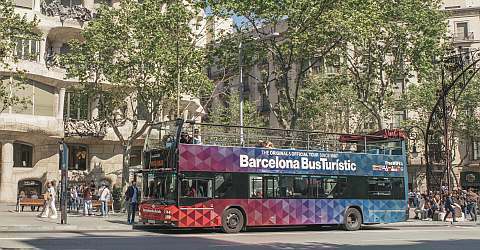 By taking Bus Turístic you will get an ideal overview over Barcelona. You can hop on and hop off at 44 bus stops. Book your tickets with group discount (10 people and up). Each group member will receive his own ticket, you will stay flexible with your group. Our guarantee: plans change, if you don't need all your tickets, you can return the unused tickets and will receive a full refund (up to January 15th of the following year, only if shipped via mail). Get to know Barcelona's sights, while enjoying the sun. The double decker bus is one of the most comfortable ways to explore the city. There are three bus lines to choose from and to hop on and hop off at the bus stops as desired in order to explore the different sights. The exact times are given in a poster on the buses. The buses run every 5-25 minutes, depending on season and usage. Book your Bus Turístic Ticket here and get 10% discount. Simply enter the number of Bus Turístic Tickets you would like to receive and select the shipping method. You can choose between shipping by post and by e-mail. Full flexibility: you can decide by yourself when you want to use the ticket during the year of validity. Our vouchers are valid for one full calendar year. Booking without risk: received by mail and unneeded Bus Turístic Tickets you can return to us until the 15.01. of the following year, we will refund the full purchase price. Shipping via mail (€4.90 shipping to EU countries and Switzerland): Choose this shipping method to receive your Bus Turístic Tickets before your arrival. Picking up the Ticket is not necessary. You are independent of opening times of the pick up locations. Validity begins with the first use of the Card. You can return any unused Bus Turístic Tikets to us up until 15/01/ the following year and receive a full refund. Here you find the shipping times. Shipping via e-mail (free shipping): Immediately after booking you will get a voucher that allows you to pick up your booked Bus Turístic Tickets directly at the bus, at the airport or other locations in the city. The voucher sent viaemail can be redeemed from 2nd January 2015 (pick up locations are listed below). You can pick up your booked ticket directly at the bus. Estació del Nord (at this bus station the busses from Girona airport stop, opened: Mon + Wed 09:00 to 19:00, Tue 09:00 to 20:00, Thu + Fri 09:00 - 21:00, Sat 10:30 - 20:00, Son 9:30 - 15:00 and 16:00 - 20:00. Book your Bus Turístic Tickets with a group discount (from 10 tickets). Every group member gets its own ticket. Interesting for larger groups: Charter a double-decker bus for a private city tour. The hop-on hop-off bus is then exclusively for your group and can also drive other routes.